Darren and Erin are absolutely amazing!! There really are no words to describe how absolutely amazing Darren and Erin are! When we first started looking for photographers for our wedding, we were so nervous that we wouldn’t find the right fit. After meeting with a few photographers initially, we didn’t really feel comfortable or excited about any of our options. Then we met Darren and Erin. We immediately clicked with them because of how down-to-earth and friendly they were. Not to mention, the examples of prior wedding photos they brought with them were nothing short of phenomenal. After making the no-brainer decision to hire Rising Star as our wedding photographer, Darren and Erin were amazing with their communication and flexibility. For our engagement photo shoot, there were a few specific styles of pictures we really liked, and Darren and Erin made it a priority of theirs to make sure we got those exact styles and were happy with them. During the engagement photo session, they both made us feel so at ease and we had an absolute blast with them! The engagement photos ended up being better than we could have ever imagined! We met with them about two weeks before the wedding to finalize all details and get ready for the big day! They were so organized and helpful during that session, giving us some much needed advice about how to make the day go a little smoother (and they were absolutely right!). We had a very early start to our wedding day, but that was no problem for them at all! They made our morning so special, and because we were so comfortable with them, it helped us feel calm on a very stressful day! We really did ask a lot of them, but not once did it ever feel like there was going to be a problem. Erin was so sweet and helpful with my bridesmaids and I, and Darren and my husband, Gavin (and his groomsmen), had a blast! We asked for a long day of pictures, but it honestly flew by because of how much fun we had! They both did an amazing job getting every picture we wanted, and had some very creative and fun ideas! We seriously could go on and on about Darren and Erin! They made our day even more special than we could have ever imagined! Thank you both so much!! Thank you so much for the wonderful review Kaylee and Gavin. What a blessed wedding day! I loved how you summed up the various components of the last year. Erin and I felt so comfortable with you both the day we met, and a friendship grew quickly at our engagement session at Hillbrook. We have shared some incredible moments the last year I will remember always. 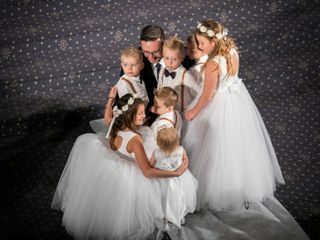 There is simply too much to say (including a bridal party photographers dream of), but I think your students and family summed it up the best at the church...you are so loved because there is only one Kaylee and Gavin. Friends always. Darren and Erin. a perfect team to work with! I cannot say enough how happy I was to find Darren and Erin for my wedding photographers. We met at the IX bridal show, and honestly, we clicked right away! They were personable and funny and super kind, and my now husband and I knew we were going to pick them. Darren and Erin both were not only great photographers, but they were both SO helpful on the day of. Erin even got me water when I was in the middle of family photos! I want everyone to know that Rising Star Photography is 100% the best choice for photographers, for weddings and other events as well! You can trust that your pictures will be amazing and they will not let you down. I love them both so much! And we love you Angela and Devin. What an awesome year we had, from an instant connection at the IX Show, to a perfect evening at Wade Park for your engagement session, and then a beautiful, almost spring-like day for your January wedding. We shared so many great times, conversations, smiles and laughs. It's been an honor, and I can not wait to work with you both again. Your friends, Darren and Erin. Darren and Erin were two of my favorite vendors to work with for my entire wedding. Not only are they amazingly professional in the breadth and scope of their photos, they really took the time to get to know me and my now husband as individuals. They let us set the pace and tone of the day, and remembered every request and concern we had given at our final meeting before the wedding. They gave us great direction to get the perfect shot and angle, but also allowed our emotions and personalities to shine through. Their efficiency and productivity is unmatched, and allowed us to stay on schedule the entire day. They cared about us and our relationship on a personal level and made us feel like the most special couple in the world. Rising Star Photography offers unmatched service and care at an unbeatable price, and they make me want to get married again just to get the chance to work with them one more time. 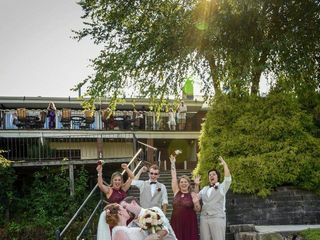 Thank you to Darren and Erin for capturing the best day of my life! Thank you so much Meagan and Nick for the wonderful review. What a way to close the 2018 wedding season with your sensational wedding! I have enjoyed getting to know you and Nick throughout the year, and your wedding day was so fun, comfortable and natural, and the dance floor was rocking! This is how a wedding is done, and I am grateful to call you both good friends. I want to relive the day as well. Your buddies, Darren and Erin. Darren and Erin were great. So easy to work with, fun, accommodating. They have done many weddings at Springvale and you can tell from their photos that they know what they are doing. Darren has tons of ideas but also willing to do just about anything you ask him too. It was a great day. We LOVED working with Rising Star!!! I have to say that choosing Rising Star Photography to do our photos was EASILY one of the best choices we made during our wedding planning process. Darren and Erin and both absolutely amazing. They are genuine, fun, and professional people that work hard ALL day to make sure they get every shot you want. I simply cannot stress how much we loved working with them. They made us feel like we had known them and been friends with them forever, there was never a moment that felt awkward or tense—they helped us through everything and had so many beautiful picture ideas. We really didn’t have to worry about a thing! Many photographers charge by the hour but that is one of the reasons we chose them, they are with you from start to finish. They care a lot about their work and your satisfaction with the results. Honestly, we loved every second of the day with them and adored the wedding photos so much that we wish we could have another wedding so we could book them a second time! Ha! Even the guests at our wedding that spoke to them that weren’t in our pictures said they loved our photographers because they were so hardworking and friendly! We definitely hope to use their services in the future for other milestone events in our lives and would recommend them to anyone that wants beautiful photos and to work with fun and caring professionals. I can not recommend them enough!!! Thank you so much Courtney and Keith for your kind words. I remember going into the 2018 bridal show season, your date was the only key date we had open in 2018. Well, there was a reason for that, as it was destiny for us to meet. The four of us knew at the show this was a perfect match, and your wedding day was everything we knew it would be and more. The fun and connection we had with you both was off the charts, and we have two wonderful friends as a result. We want to relive the day as well. We love you both. Friends always, Darren and Erin. We will never be able to say enough amazing things about Darren and Erin! Picking a wedding photographer is one of the most important things when planning a wedding, and we are so happy we entrusted our big day with Rising Star! We met with Darren a few times before the big day, and he is so personable, accommodating, and genuine. He has become a friend to us! He would respond to emails and texts very quickly, and made the whole process very stress free. He answered all of our questions and checked in throughout the year. When it came to the big day, Darren and Erin made the whole thing so fun and enjoyable for us! They made us all feel so comfortable and made sure we were all having fun the entire time. 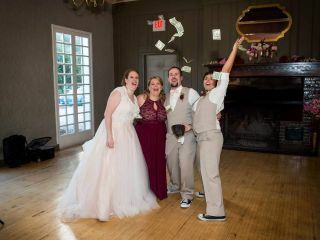 They truly became our friends and we were so happy to have had them there on our wedding day! As if our amazing experience hadn’t been enough, once we got our pictures back, we knew it was the best choice we made. Every single picture is amazing and we don’t have any bad ones at all! We can’t thank Darren, Erin, and rising star enough for this incredible experience! The week after my wedding, my sister booked them to do her wedding because they’re just that amazing! 100% recommend, you won’t be disappointed! Thank you so much Julia. What a heartfelt review. Erin and I feel the same about you and Bobby...you are such a special couple that became family to us. What a beautiful wedding day! We had so much fun, and your reception was literally one of the best ones I have ever been a part of in my career. Please stay in touch, but we will see you next November for your sister's wedding for sure. Your friend, Darren. We loved Darren and Erin! I would highly recommend them to anyone looking for an awesome, fun, outgoing photographer! They have the best price for everything they offer. You will not be disappointed. I am so happy we chose to have them for our wedding. I even booked my venue and date around when this photographer was available because we wanted them that badly! Perfect choice for your wedding! Thank you so much Lauren. I am so happy I met you and Nathan at Olivia and Derek's wedding. We bonded that night, and I felt so comfortable with you both during the whole process. What a beautiful wedding day you had, and a ton of fun we all had together. Many great memories of a blessed day. Your friends, Darren and Erin. 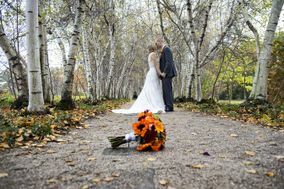 Darren and Erin were fantastic photographers and I would highly recommend using Rising Star for your wedding! From the first meeting, to the engagement shoot, to the actual wedding, to the follow up, they were great every step of the way, and the pictures came out beautifully. Very professional and talented. Thank you so much Zack and Kayla. I have had a really fun year working with you both. So many great memories. It has been an absolute pleasure and honor, and I gained two wonderful friends as a result. Friends always, Darren. I don't have enough positive words to describe the experience my wife and I had with Darren and Erin. Our wedding experience wouldn't have been as great as it was without them. The photos were amazing! These are two extremely talented people. During the wedding process they have become friends to my bride and I! HIRE THEM!!! Thank you so much Fabyen and Tiffany. What a blessed wedding day! Your portrait session was so beautiful...I will never forget how much fun we had at Coulby Mansion. I will also remember how fast we connected at the IX Center bridal show. This was a perfect match, and as you said, we now have two wonderful friends. Love always, Darren and Erin. We knew we wanted Darren for our wedding from the moment we met him and saw his work, and we were not in any way disappointed in the result. Darren was completely professional throughout the entire process, and genuinely fun to work with on the wedding day. He was willing to work with us to give us exactly what we wanted throughout the day, and he had plenty of great ideas for excellent pictures. He did a fantastic job of capturing every aspect of our wedding day. His turnaround time was just as fast as advertised, and we just had an amazing night reliving our wedding day through his work. We want to continue to use him for all of our photography needs going forward, and can confidently recommend him for your big day! Thank you so much Jen and Matthew for a wonderful review. I will need forget our first meeting and how comfortable we all were. It was a perfect fit. What a blessed wedding day, beautiful location on the lake, and a wonderful couple and bridal party to work with. I will carry many great memories. Thank you so much. Your friend, Darren. AMAZING! Hiring them would be the best decision you can make for your wedding. First of all, all I can say is if I could give them more than 5 stars I would. They made our wedding a huge success! We found them on wedding wIre and it was honestly the best decision that we made for our wedding. From the very beginning of meeting them we knew they would be a perfect fit for us. They made us feel extremely comfortable through the entire process and were very prompt with getting back to us with any questions that we had. I can honestly say that Darren and Erin were more than photographers on that day, they were friends that were photographing our wedding. They made the whole day stress free and they scheduled everything so I didn’t have to worry about anything. Erin felt more like a bridesmaid with how much she cared about the placement of my dress and just making me feel beautiful! All of my guests RAVED about them the whole night! We still have people that comment of how amazing they were and how they captured every detail with the guests barley realizing they were there! Not to mention we got our pictures one month from our wedding date and they turned out AMAZING! Hiring them for your wedding would be the BEST choice that you can make! We love them like they are family and had the best day of our lives with the help from these amazing people! Thank you so much for the incredible review Cassie and Scott. This was meant to be, as I originally had another wedding on your date that was postponed. Just when I thought I may not have a wedding on your date, you found me on WeddingWire.com and we had the best conversation on the phone, followed by a meeting where it was very clear this was the perfect combination. It has been a joy and an honor my friends. Cassie: I still want to adopt your parents as my second set of parents...LOL. They are the best, and it was a joy to share some wonderful moments with them as well. Please stay in touch and I can not wait to see you both in the future. Your friend, Darren. Darren was phenomenal to work with! He put our needs first and was so quick to process everything! He was a great communicator and very organized with the whole process. He is high energy and full of passion for what he does. Great choice all around! Him and his team will do their very best to make sure your day is captured in a beautiful way. Thank you so much Megan and Nick. I really enjoyed our meetings and appreciated how organized you both were as well. Your timeline was just perfect for maximum enjoyment. You are such a wonderful couple, and I felt so comfortable working with you both. We had wonderful chemistry from the start, and I will remember your wedding forever....what a blessed day it was. Your friend, Darren. I highly recommend Rising Star Photography. Darren is the absolute best. It was such a joy working with him. We first got together to do our engagement photo shoot which was a BLAST! My husband and I learned how to be in front of the camera while Darren took note as to how we worked together. It was such a great experience. We had so many laughs! Darren had some great ideas and poses and also took all my ideas into play. He is so easy to work with. We were so happy with the outcome of our engagement shoot that we couldn’t wait for our wedding day. Darren and Sarah were both there to capture all the amazing moments of our (very long) day! It couldn’t have gone any better. They were very helpful with everything and went above and beyond their duties of photographers. The pictures turned out amazing and we got them back super quick! Throughout all the planning, I was able to ask Darren for help/advice/opinions. He is very knowledgeable, confident and so honest. We appreciated this very much. I cannot thank him enough for all he has done for us these last two years. It was such a blessing working with him and I plan to use Rise Star Photography in the future! Thank you for such a heartfelt review Deena. What an incredible story we have shared the last two years, from our strong bond at the bridal show and initial meeting, to one of my favorite engagement sessions ever. Working with you and Taylor was perfection, and the farm he grew up on. We simply connected and trusted each other immediately, and the creativity just flowed. Many brides have commented on how natural and candid your engagement session looks, and that can only happen with great synergy. When your wedding day arrived, we were friends and kept the great times rolling. I am so blessed to have met you both and was honored to be your wedding photographer with Sarah. A big thank you to your parents and brother as well for making us feel like family. Friends always, Darren. My wife and I got married on August 3rd, 2018 and used Rising Star for our photography. Darren and Erin were the photographers and truly made our experience with them SPECIAL. When we first met Darren we were blown away by his legitimate interest in our love story. He asked questions about how we met, how long we had been dating and what we envisioned for our wedding. He made such a great first impression and we were blown away by his professionalism and honesty. Throughout the entire process, Darren and his team made us feel so valued. My wife and I both felt that Rising Star Photography wanted our day to be an event of a lifetime. Whenever we had questions Darren always emailed back promptly with answers or suggestions which helped with the stress of planning a wedding. On our wedding day, Darren and Erin were so professional and FUN. You could tell they LOVE what they do! They worked so well together and had wonderful ideas for our photos. Additionally, they made sure to get all of the shots that my wife and I wanted. They asked us multiple times throughout the day if we needed anything which was so thoughtful and caring. Darren and Erin felt as if they were family the way they connected with us, our wedding party and most importantly our family. When we got our photos back we were blown away by how wonderful they all came out. It was so much to fun reliving every moment through our amazing pictures. When our family saw them they said the same thing! We could not have picked a better photography team and in our opinion Rising Star Photography is the absolute best. If you are planning your wedding and value photography, Rising Star Photography is the only choice due to their professionalism, ability, personality, and willingness to go above and beyond to make your wedding day spectacular. 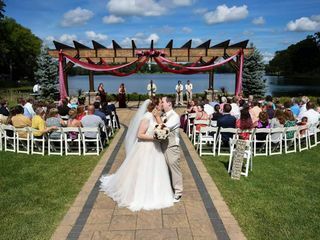 Thank you for such a wonderful review Mike and Jessica, and describing in detail what was literally a perfect wedding day. If I wrote a book describing the perfect wedding timeline, I would use your wedding as the example. You are two of the nicest and most genuine people I have ever met in my life, and it was a honor to be a part of your wedding. The fun, romance, laughter and creativity was off the charts. What I really loved is how you both, your bridal party and family opened their arms to me and Erin, and we truly felt a part of your family. I witnessed and was part of a beautiful and powerful love story August 3, 2018 that I will cherish forever. Love you both, and I am always here for you. Your friend, Darren. I highly recommend using Rising Star Photography! Darren made the process leading up to the wedding easy. He was always organized and quick to respond. He spent time getting to know us. He also spent time creating a schedule for us for our wedding day, which was extremely helpful in making everything come together. Our wedding day would not have been the same without Darren and Erin! They made the experience so fun and enjoyable. 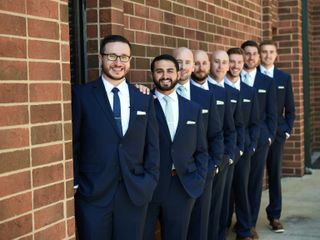 The bridal party and groomsmen, as well as families, also loved working with Darren and Erin because of the happiness and joy they brought. They even stayed after our wedding reception was over to capture a few awesome photos of us at the end of the night. They truly love what they do, and we were so thankful we chose them. Not to mention the pictures were everything we could have hoped for! Thank you so much Sara. Working with you, Austin, your bridal party and your family was one of the highlights of the summer. Having an extensive pre-ceremony, portrait session, and after-party really gave us some special moments to bond. Erin and I did not want the party to be over...we were all having non-stop fun. A perfect day in every way. This is how a wedding is done, and we walked away gaining two wonderful friends. I will never in my career forget the night compositions we captured at Music Box Supper Club. Love, Darren and Erin. Darren was wonderful to work with throughout the whole wedding planning process. He was always prompt in responding to questions and emails. Sarah, who was Darren’s assistant for our wedding day was great as well. She took time in talking with each of my bridesmaids and both of the mothers. She instantly blended in with the group and was an absolute blast to have around as all the girls were getting ready. Both Darren and Sarah were present for the large majority of the day, they didn’t put any pressure on us with hour constraints, like many other photographers would have done. Both took their time in capturing the moments, but also knew how to have fun and get creative, which made the picture session much more enjoyable. Another thing that we both appreciated was that both Sarah and Darren sought us out and asked us individually (my husband and I) if there were any other pictures we wanted them to capture before they headed out for the night. It said a lot about them ensuring that they met our expectations and that they hadn’t missed anything of importance to us. I highly recommend their photography services to anyone looking for an amazing photographer, while still staying within a wedding budget! Thank you Christina and Andre. I have really enjoyed getting to know you both during your wedding planning process, and gained two wonderful friends by the time your wedding day came. What a blessed day it was! It started out as an 80% chance of rain all afternoon, but we did not get a drop and it was a beautiful, comfortable and perfect day. From creativity, to romance, to playfulness, the day could not have gone better, and Erin and I were honored to be a part of it. We luv ya both, Darren. 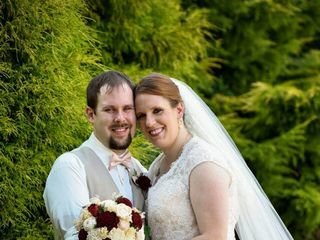 My wife and I couldn't be happier with the quality, professionalism, and genuine love we received from Darren and Erin of Rising Star Photography. From the moment we met them, all the way to our big day, they were nothing but the kindest and most helpful people we had the pleasure of working with. These are people who truly, without a doubt, love what they do. Their experience with countless weddings was a huge help to us as we planned everything out. They were able to walk us through our whole day's itinerary, start to finish, giving us valuable advice that allowed our day to run flawlessly. The actual photos we received were absolutely stunning but we were not one bit surprised. Just seeing all of the work and planning that they put in leading up to the wedding as well as the level of professionalism they showed from start to finish, we had no doubt that the final product would be flawless. By working with Rising Star, we did way more than just hire 2 photographers, we found 2 truly amazing people to celebrate our wedding day with. Absolutely amazing!! I met Darren two years prior to my wedding at a bridal show. Throughout the years I kept in contact with him beacuse my husband and I knew he was going to be our wedding photographer. We finally set the date, and began planning our wedding. Rising star Photography was the first vender we got to check off the list. On 6/30/2018 I got to marry my best friend, seven months prior to that day my little sister had passed away suddenly. How are we supposed to finish planning a wedding that we are completely putting together ourselves after something like this? My little sister was also one of my bridesmaids. After Darren had learned of what had happened on facebook he contacted me with his condolences, and asked if we could meet for coffee. During our meeting Joseph and I expressed that I was going to turn the handmade bouquet that I made for Blaire into a wreath that will be walked down the aisle in her place. We told him that this was one of the biggest moments that we wanted captured. He was more that happy to accommodate our requests. He even gave us the great idea of having an isle at the alter to place the wreath on. Throughout friendly conversation we had expressed that it was very hard putting together a wedding ourselves after something so tragic happened so close to our wedding date. We were having a hard time finding a videographer to capture our day and all of the moments that celebrated blaire. When we got home we recieved an email from Darren containg of all of the videographer that he knew. Unfortunatly, each and everyone of the businesses he recommed were already booked. A few days later we recieved another email from Darren. This email contained links to other videographer in the area that had the date available for us. He expressed to us that he had never worked with any of the businesses, and he couldnt vouch for them. Darren, it was the thought that counts, we were able to book the videographer for our wedding because of what he had done for us out of the kindness in his heart. Darren and Erin had done more for joseph and I then just takes our beautiful wedding photos. They were able to assist us in everyway that that they possibly could while we were grieving for my sister and planning our wedding. I am happy to say that besides that fact that they will be taking our family photos for the rest of our lives, they will forever be our friends. Bailey...thank you so much for the kind words and tribute. You and Joey became like a sister and brother to me during the planning process. Anything I could do to help and honor Blaire was an honor. Your wedding was truly blessed, and an incredible day from start to finish. Love you both, and friends always, Darren. Darren was an essential part of our day! He made sure we were taken care of and our pictures came out absolutely beautiful!! I would recommend Darren and his team every time to someone looking for a photographer!! Thank you so much Rachel and James. It has been incredible working with you both the last year, and forming a wonderful friendship. What a perfect wedding day, and one of the best receptions ever! Love you both, and I know we will be seeing more of each other in the future. Your friend, Darren. My husband and I just got married on 6-16-18 and we had the absolute BEST experience with both Darren and Erin! They were photographers for a friend of mine as well and the pictures are stunning! We were SO comfortable with them! They made our wedding day that much more perfect! Thank you both x a million! Thank you so much Brittany and Steven. I am so happy Amanda referred you to me. It was a perfect combination, and I could sense that at our first meeting. We became friends through the process, and your wedding day was so comfortable, natural, trustworthy and fun. A beautiful day all across the board that I will remember forever. Your friend, Darren. We had such a wonderful experience working with Darren and Erin. They were very affordable and were able to provide us with our photos in a short turn around. They were very easy to work with and made taking pictures a breeze. We would highly recommend them to anyone. Thank you so much Monica and Mike. What a blast we had on the Towpath Trail in Peninsula...I will remember those moments forever. Erin and I were honored to be your wedding photographers. What a beautiful day it was and a great time we had. Your friend, Darren. Darren and Sarah were great! They were very easy and fun to work with and really know what they’re doing. We had great fun and pictures with them. Thank you Paige. I had so much fun working with you and John the last year. We bonded right away at our first meeting and engagement session, and your wedding day was so comfortable and natural. There were several incredible moments I will never forget, and the whole day was non-stop fun. Friends always, Darren. Our photos came out absolutely gorgeous. We used Rising Star for our engagement session as well as our wedding day and look forward to future sessions when we decide to have little ones. We are so happy with our photos & Darren and Erin are so great to work with! They are not only amazing photographers but also such amazing people. 100% recommend. Choose them! Thank you so much Katie. Erin and I really had a special bond with you and Julian from the moment we worked together. We shared some special moments the last year I will always cherish, and now we have life friends. Luv ya both, Darren. Scott and I could not have chosen a better photographer. Darren and Erin did an AMAZING job capturing the beauty, fun, and excitement on our wedding day. They were extremely easy to work with and open to anything. And they stayed for our ENTIRE thing-pre wedding festivities, wedding ceremony AND reception! Talk about commitment!! We loved the way our photos turned out and are so happy we went with them! Will be recommending to everyone! Thank you so much Annie. Even though 2018 is only halfway through, I know your wedding will be one of my favorites of the year. What an incredible day, and working with you, Scott and your bridal party was a dream come true. Erin and I love you both, and will carry so many incredible memories. Your friend, Darren. Working with Darren and Sarah was nothing short of amazing. 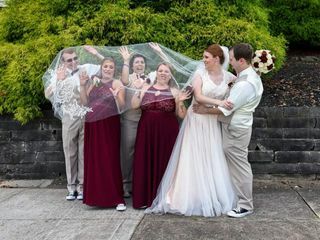 They really kept the flow of the day going, they had the most amazing spots for us to take pictures at, they melded well with our bridal party and went above and beyond for us. They were professional but didn’t take away from the fact we were a goofy group. I would recommend Rising Star photography for any bride looking for a photographer/unofficial wedding planner/friend all in one! Thank you Darren and Sarah! Thank you so much Peter and Theresa. It's amazing how we met at a little event, and I am so glad we did. I had so much fun getting to know you both better over the course of a year, and your wedding was everything I knew it would be. It was non-stop enjoyment from start to finish, and I will never forget our incredible portrait session downtown. Your photographer, wedding planner and friend, Darren.